At FYZICAL®, we offer a wide range of physical therapy treatments to help you get back to living your best life. Our expert physical therapists specialize in many different PT treatments, including post-operative rehabilitation, balance disorders, and more! As Top Rated Local® physical therapy clinic, you can rest assured knowing that our therapists will give you the attention and care that you deserve. Visit our Severn location or contact us to schedule an appointment. Have you ever experienced pain or discomfort while doing something that you love? If you have, then you know that it can discourage you from doing those activities, and if you feel that pain and discomfort while performing normal, daily activities, then it can really diminish your quality of life. 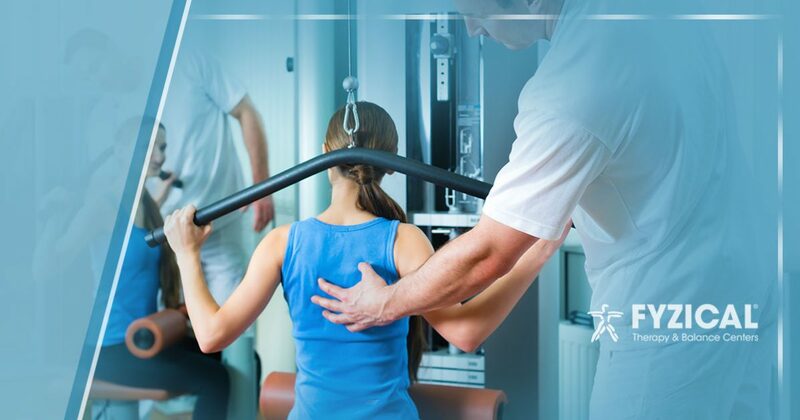 At FYZICAL® we strive to help you take back your life by providing you with whatever physical therapy you need to feel like you can get back to living your life pain-free. If you want to get back to living the life you were meant to live, request our BODYQ™ assessment. BODYQ™ will assess your overall health and wellness, body function, balance, and more, to help our physical therapists determine the best way to help you. With this assessment, we can provide you with the care that will help you get back on your feet feeling better than you have in a long time. Nobody should have to live day after day in pain or discomfort. Whether daily tasks have become more difficult or you don’t enjoy your favorite activities because they cause you pain, the experts at FYZICAL® can help. To learn more about our specialties, and to receive the treatment you deserve, contact FYZICAL® or stop by our Severn location today!